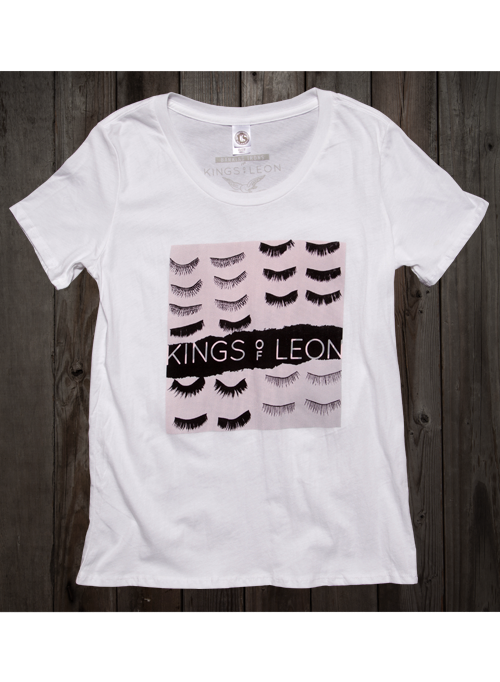 Show your love of Kings of Leon in style with this pop art womens T-shirt. Featuring a bold graphic pattern of eyelashes on a pink background surrounding the name of the band, this shirt is a stylish addition to any wardrobe. Made from the highest quality 100% cotton, this womens short sleeve eyelash art shirt is soft white with a scoop neck for comfort and class. Available in sizes small to XL through RockAndRollTShirts.com.